Bernardo Belloto, sometimes called Canaletto (1721-1780) was born in Venice and trained there by his uncle, the view painter Giovan Antonio Canal called Canaletto (1693-1768). He became a member of the Venetian painters' guild, the Fraglia, in 1738. In the 1740s, he travelled in Italy (Florence, Lucca, Rome and in Lombardy). In 1747, Bellotto was invited to Dresden in 1747 by Frederick-Augustus II, King of Poland (as Augustus III). He went to Vienna in 1758, perhaps in response to an invitation, and to Munich in 1761. By the end of the same year he had returned to Dresden where he was made court painter in 1768. He had trained and worked with his son Lorenzo who died prematurely in 1770. 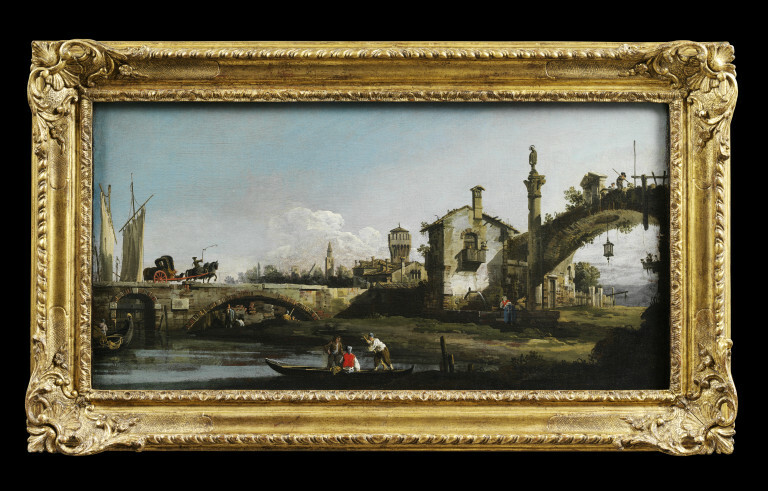 This painting is a good example of Bellotto's art of 'capriccio', which displays an elaborate construction partially based on previous compositions. The artist probably drew his inspirations from the surroundings of Verona and Padua in Italy, a region that he visited in the first half on the 1740s. The painting shows a fantasy town view with on the right a gatehouse and an archway, a Corinthian column surmounted by the statue of a saint and a woman drawing water from a fountain. On the left, a horse-drawn carriage is running on a bridge while in the background a raw of houses with a medieval tower recedes into the distance. Figures manoeuvring boats are depicted in the foreground. A town view showing on the right a gatehouse and an archway with a hanging lamp, a Corinthian column surmounted by the statue of a saint and at the feet of it, a woman drawing water from a fountain; on the left, a carriage running on a bridge and sails at the far left, in the background a raw of houses with a medieval tower receding into the distance, while figure are manoeuvring a rowboat in the immediate foreground. Historical significance: The attribution to Bernardo Bellotto, Canaletto's nephew, was accepted by Michael Levey (note on file, after a visit on 7 September 1960), who suggested a date of 1740-7. It appears to be a good example of Bellotto's works of the mid-1740 when he was working on the four 'capricci', formerly in Sanvitale collection, now in the Galleria Nazionale, Parma, just before his departure for Dresden. These are based on drawings that reproduce identical motifs as those depicted here. The present work shows the gate of a town with an arched bridge leading into it on the left and a gatehouse adjacent to a large archway on the right. The picture is dominated by Veronese and Paduan motifs such as the house flanked by a medieval tower, similar to the Paduan Ezzelino tower, in the middle background, while the right hand-side of the composition is taken from a drawing with variations in the Royal Collection (RL 7530/P[C]126). 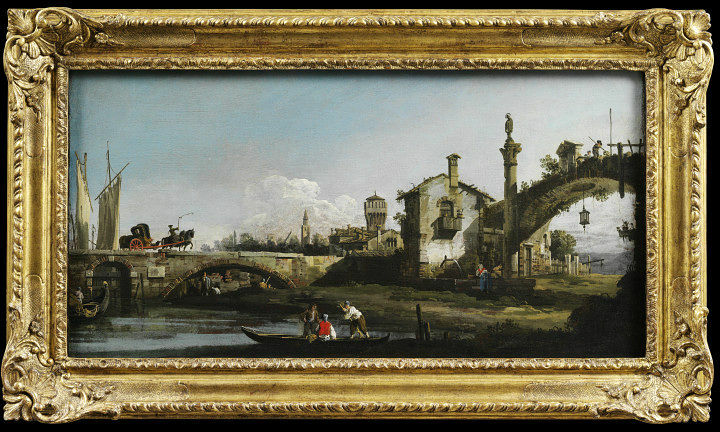 The bridge and the tower appear in another 'capriccio' of the early 1740s, in the Thyssen-Bornemisza Collection, Castagnola. The present composition contrasts neutral tones against vivid colours and as light against shade. The solid and imposing architectural setting is inhabited by small figures: a woman drawing water, men in boats and a carriage drawn by horses. The restricted palette of blue, brown and neutral tones is enlivened by small touches of red in the vest of the woman next to the fountain, the man on the boat and the carriage. The gatehouse and the archway are unified by large passages of shadow that enhance their function as repoussoir device in order to lead the spectator's eye into the picture, while patches of light around the archway enhance the sense of depth. 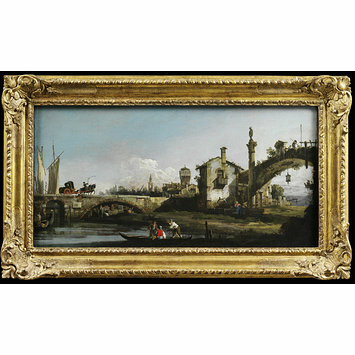 It has been suggested that this painting was intended as a pendant to Canaletto's 'capriccio' also bequeathed by C.H. Townshend (1352-1869) (Kowalczyk, 2008). A 'capriccio' is a painted, drawn or engraved composition that combines imaginary and realistic architectural features in a picturesque setting, often dotted with small figures, and mostly displayed as wall schemes for interior decoration. It emerges as a genre during the early 18th-century Rococo period, and became extremely popular during the era of the Grand Tour, stimulated by the need of recording topographical settings. The Italian landscape, which abounded with classical ruins, was especially favoured for this new genre painting. It particularly developed in Venice with such artists as Marco Ricci (1676-1730) and his uncle Sebastiano Ricci (1659-1734), together with Canaletto (1697-1768), Giambattista Pittoni (1687-1767) and Giovanni Battista Piazzetta (1682-1754), and in Rome where Giovanni Paolo Panini (ca. 1692-1765) was the most representative of the 'capriccio' painters. The genre declined during the early part of the next century, gradually transformed and was eventually absorbed by the Romanticism. Bozena Anna Kowalczyk ed., Canaletto e Bellotto: L'arte della veduta, Milan, 2008, no. 79, pp. 198-9. M. Levey, 'Bernardo Bellotto. By Stefan Kozakiewicz', The Burlington Magazine, September 1973, p. 615. E. Camesasca, L'opera completa del Bellotto, Milan, 1974, p. 95, no. 69.